With the presidential election next week, violence continues to mount in Afghanistan, and our soldiers are being caught in the crossfires. Just this week, 29-year-old Capt. Matt Freeman of Richmond Hill, Ga., was killed. He was a graduate of the U.S. Naval Academy and engaged to be married. 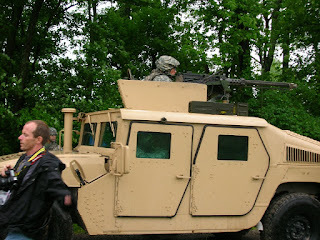 After Mom spent the day with the 48th at Camp Atterbury, Indiana, she developed an entirely different appreciation and awareness of the men and women soldiers' sacrifices. And like many of us, she now has family there with her own cousin Joel Kimsey serving in Afghanistan. *Donate clothing: Lipson's Fabrics space will be open from Tuesday through Thursday, 3-6 p.m. and Friday 10 a.m. to 5 p.m. to receive your donation. *Attend the sale on Saturday and make a purchase. Tonight, when you hit the hay in a comfy bed, under a real roof, built under a freedom-loving sky, let's all take a moment to send our prayers to this area of strife in our global community, where brave men and women like cousins Malachi and Joel are over there doing the best they can, under unfathomable circumstances, so we can go on living like we do. P.S. Pictured is one of Mom's pics from Media Day in Indiana with the 48th. Even though it was a simulation, this solider is currently doing this for real these days, every day, in Afghanistan.